The history of San Francisco's cemeteries is one of relocation. After 1900, the expanding city got rid of most of the cemeteries, citing health issues among its residents. Those remaining in San Francisco are San Francisco National Cemetery (Presidio) and Mission Dolores Cemetery. Many of San Francisco's graves were re-interred at Colma, south of the city. There are also famous tombs at Mountain View Cemetery in Oakland. 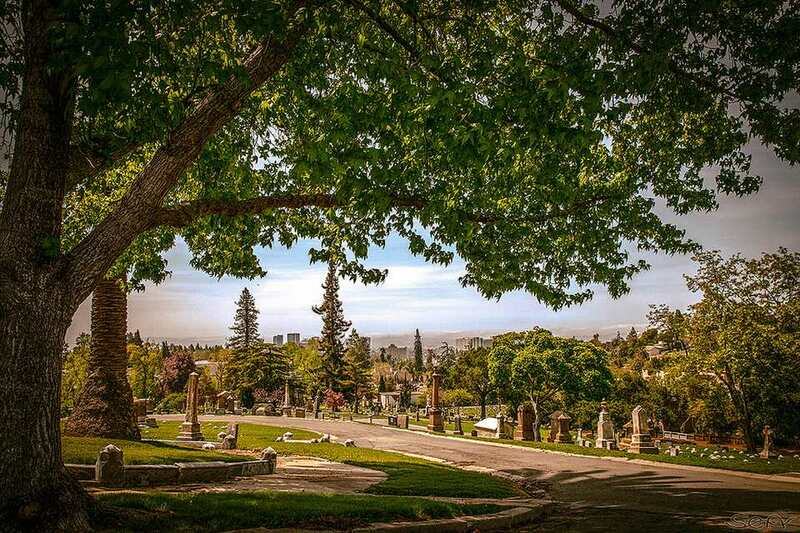 The list below shows cemeteries where visitors can pay respects to some of San Francisco's famous, though several of SF's most legendary personas -- like Robins Williams -- had their ashes scattered, in the late actor's case over San Francisco Bay. See the Find a Grave Website for detailed descriptions of famous graves throughout the Bay Area and California. Maj. Gen. Frederick Funston, whose named was given to San Francisco's Fort Funston, today a premier hang-gliding spot. The National Park Service schedules regular (free) tours of this historic cemetery. Check the monthly schedule for upcoming tours. San Francisco National Cemetery slopes upward on a hill, with views to the Golden Gate Bridge. Not far from here is the Presidio's equally famous pet cemetery. This pet resting place is shaded by trees, lush with greenery -- and filled with poignant memorials to beloved companion animals. The Mission Dolores Cemetery holds the graves of 5,000 Ohlone and Miwok, along with others who built Mission Dolores. Markers date from 1830 to the late 1800s. The cemetery is a quiet, walled garden adjacent to the historic mission. It's a memorial place steeped in its own history, feeling more like a European church enclave than one in the middle of San Francisco. Keen-eye observers may recognize the place from Alfred Hitchcock's 1958 thriller Vertigo. Mountain View Cemetery climbs a steep hill from Piedmont Avenue, opening to panoramic views of San Francisco Bay and Oakland. The Crocker and Ghirardelli mausoleums reside on Millionaires Row -- near the top, with sweeping vistas. Docent-led tours happen at 10 am on the second Saturday of each month. Cypress Lawn is huge, spanning multiple sections across El Camino Real. The section on the east side, past the ponds and through the castle-like portal is the most dramatic in terms of monuments and setting. The reception in the main office at Holy Cross has a walking tour brochure for those interested in paying respects at the individual sites. The most famous interment at Hills of Eternity Jewish cemetery is Wyatt Earp, known best for his part in the Gunfight at O.K. Corral in Tombstone, Arizona. Hills of Eternity closes a bit earlier than some of the other cemeteries along El Camino Real in Colma which are generally open sun up to sun down. Hills of Eternity found its way into song lyrics on Buckethead's ​Colma album. The most famous graves at Woodlawn are that of Etienne Guittard (founder of Guittard Chocolate), and Emperor Norton (Joshua Abraham Norton) --​ an iconic figure in San Francisco history. You'll often hear that famous author Henry Miller is buried at Woodlawn. The confusion arises because of the fact that California cattle rancher Henry Miller is, in fact, interred at Woodlawn. The famous author, on the other hand, had his ashes spread at Big Sur -- the coastal retreat that's also home to the Henry Miller Memorial Library. This columbarium (repository for human ashes) was part of the Odd Fellows cemetery, the graves from which were moved to Colma. The ashes of Harvey Milk, California's first openly gay elected official, and music promoter and "Summer of Love" guru Chet Helms are interred here, along with SF's iconic "twin" sisters, Marian and Vivian Brown. It's an unusual space that's well-worth a visit.